Green vegetables… Oh, my! We all know that we need to add them to our diet in a daily basis. This is so important for your health, but some days it is hard. Too busy, too tired… I am facing the same issues. Finding quick ways to cook veggies help us to keep on track. I love spinach and I have learnt to cook them here in Canada, more exactly to cook them differently. In France, we have had the tendency (30 to 40 years ago… I am not sure if we are still doing this nowadays) to boil mostly all the vegetables before to “sauté” them in butter or olive oil. Imagine the impact of boiling for several minutes delicate on vegetable like mushroom and spinach. Yaqui … the spinach turns dark green/kaki color and has no taste, and the mushrooms’ texture is similar to rubber without any flavor. I have grew up learning this technique of cooking… no questioning at that time about taste or texture! Cooking in Canada was a new adventure where I have learnt to cook vegetable differently. During my first few years here, I shared my apartment with Chinese girls, students like me at University of Toronto, who are my friends now. They were exceptional cooks. I have learnt how to cook Chinese food, and more importantly I have discovered the technique of stir fry, and this technique has changed my life – more specifically my way to cook vegetable. I am not cooking anymore the same way, and cooking vegetable is now my number one talent. Thanks to the Chinese cuisine! Stir fry takes only a few minutes. It is an easy way to cook spinach (no excuse like I am too busy) and keep the overall nutritional and health value of this fantastic veggie. As I have explained in a previous blog, spinach is one of the best sources of magnesium… so important for your health. Another important aspect is the fact that if you are cooking spinach with some fat, you are going to improve the absorption of its mineral and vitamins content. You can use, vegetable oil or why not, grass-fed butter, pastured lard or bacon fat. 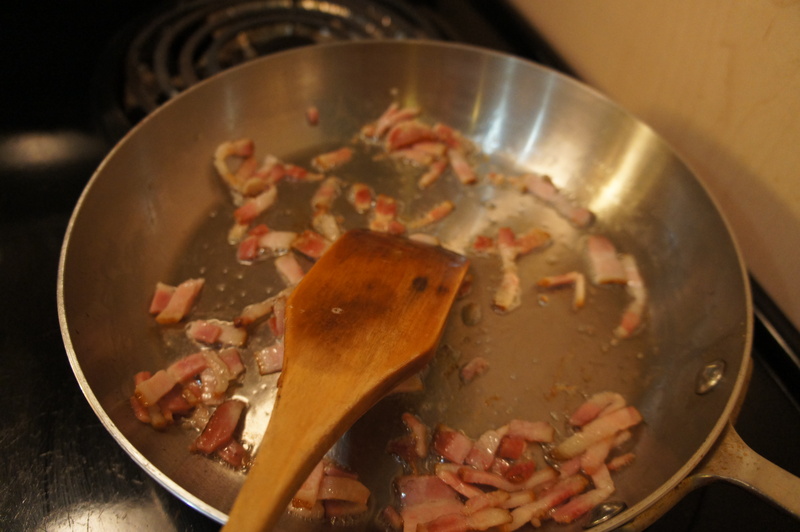 I am using bacon in this recipe, for extra taste. This is the Chinese way to cook vegetable with a little of ground pork meat for taste. As explained so nicely in a blog of Nourished Kitchen, lard is still on disgrace, and this despite the fact that monounsaturated fat, the same fat that makes olive oil and avocados so healthy, is the primary fatty acid in lard (~ 40-45% of the fat content). The remaining 55-60% is a combination of saturated fat (~37-42%) and polyunsaturated fat (~ 18-23%). Lard is also a potently rich source of vitamin D, the second richest source after cod liver oil. This is only the case if the fat comes from pasture-raised hogs. Hogs, like humans and unlike cows, are monogastric animals and they manufacture vitamin D in their skin which makes their fat extraordinarily rich in this fat-soluble vitamin. To date, up to 60 to 70% of the Canadian population is suffering from insufficient and deficient levels of this vitamin as sunlight alone is typically not adequate in replenishing vitamin D stores and some should be consumed in the diet. The inclusion of pastured lard as well as supplementary cod liver oil and the eating of oily fish helps to ensure you get plenty vitamin D which is essential for proper immune system function, cognitive health, regulation of inflammation, calcium absorption and overall systemic wellness. 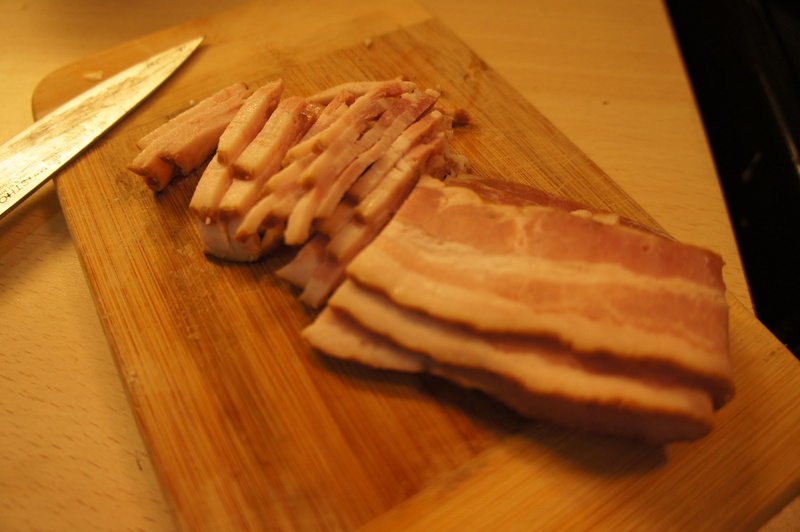 Try to add some pasture-raised lard or bacon to your diet. 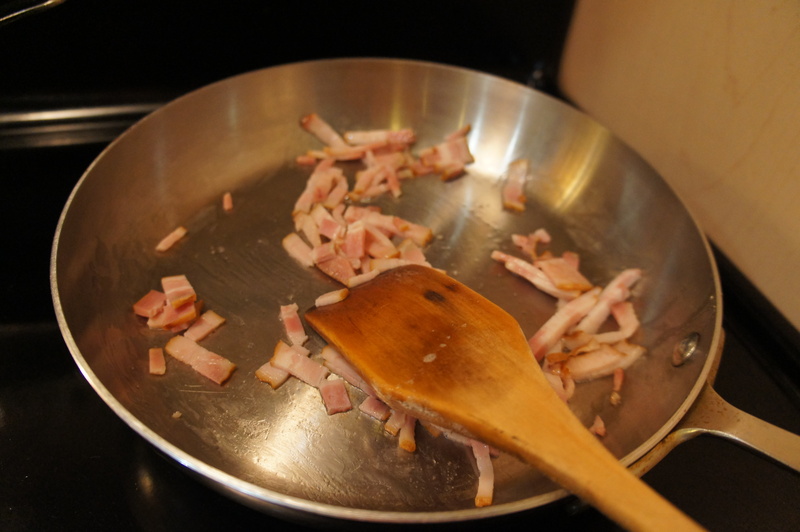 In a very large pan or skillet over medium heat, cook bacon for 5 to 7 minutes until it begins to get a nice brown color or you begin to salivate at the incredible smell. 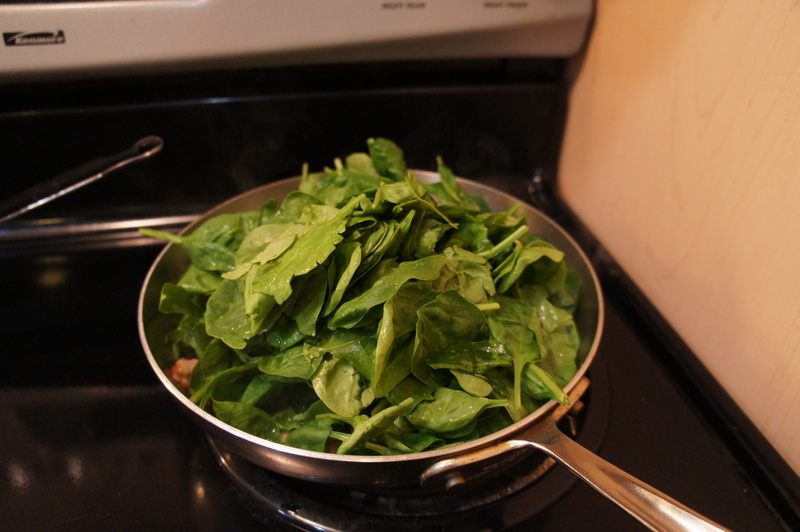 – Increase heat to medium/high, and fill skillet with as much spinach as will fit. Season with pepper. 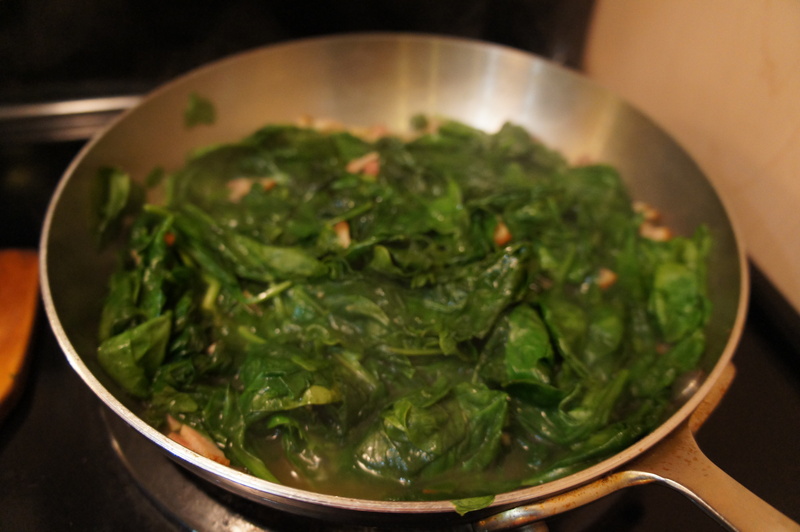 Cook, tossing spinach and adding more as it wilts (it may take up to 2 minutes to fit it all). Continue to cook until tender, 1 to 3 minutes. 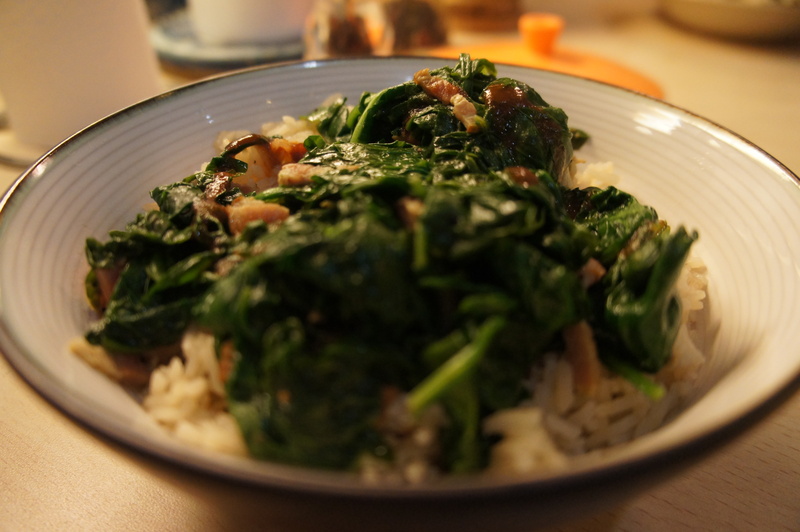 Using a slotted spoon, lift the spinach to a serving bowl that contain beer infused rice pilaf or rice and quinoa. Serve hot.